Comfortably created with you in mind, your spacious room affords you a fireplace, wet bar/refrigerator, in room coffee/tea service and a private balcony. You will welcome the generously sized vanity/dressing area with a full-sized closet, complete with comfy robes for your use while being our guest and satin hangars for those delicate items. Relax on your patio/balcony (most rooms) and enjoy the crispness of the early coastal mornings or the magnificent evenings as the distant sounds of the water "carry you away". A silver trayed continental breakfast is delivered each morning at your requested time. 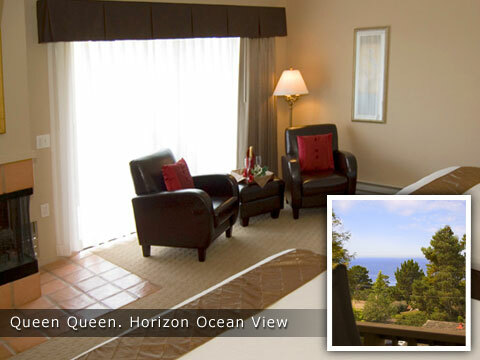 Choose from Courtyard View, Village View, Ocean Orientated or Horizon Ocean View. Your room overlooks the interior courtyard of The Adobe Inn. Enjoy the lovely array of assorted potted plants, fantastic murals and sounds of water from the fountain. Your private balcony is a haven. Orientating to the ocean, you can hear the the gentle pounding of the surf and the seagulls off in the distance. This is an absolute perfect setting for morning coffee, breakfast or relaxing at any time, day or evening. ADA Mobility Accessible and Communication Assistant rooms available.